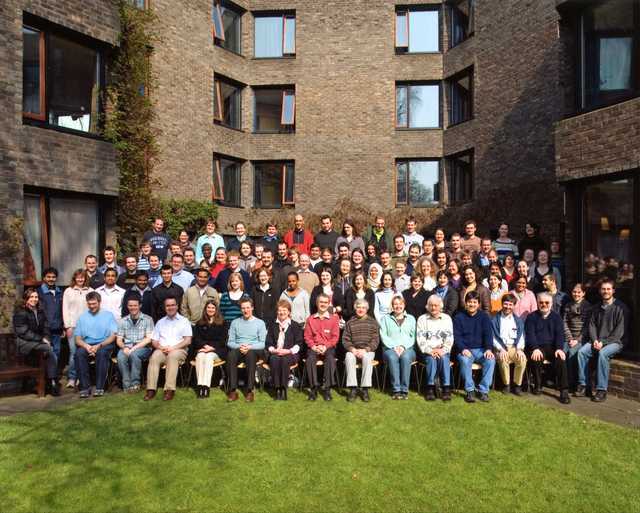 Participants at the 11th BCA Intensive Course in X-ray Structure Analysis. A separate identification key is available. The legend gives the following names: 1 Ross Harrington, 2 Stephen Moggach, 3 Simon Parsons, 4 Sarah Barnett, 5 Andrew Bond, 6 Judith Howard, 7 John Evans, 8 Bill Clegg, 9 Claire Wilson, 10 David Watkin, 11 Andres Goeta, 12 Christian Lehmann, 13 Sandy Blake, 14 Hazel Sparkes, 15 Mike Probert, 16 Vania Andre, 17 Bellam Sreenivasulu, 18 Anna-Marie Fuller, 19 Anil Jayasundera, 20 Rajiv Paneerselvam, 21 Akmaljon Tojiboev, 22 Manishkumar Shimpi, 23 Rachel Gill, 24 Harriott Nowell, 25 Haregewine Tadesse, 26 Joanne Ledger, 27 Catherine Frankis, 28 Caterina Bezzu, 29 Anabel Morte-Rodenas, 30 Lucia Romero-Perez, 31 Sonia Carabineiro, 32 Sofia Derossi, 33 Thushitha Mahenthirarajah, 34, Nizar Issa, 35 Andy Parkin, 36 Alex Hamilton, 37 Chris Carruthers, 38 Stephen Cairns, 39 Loretta Lawton, 40 Peter Byrne, 41 Jorge Barrio, 42 Benjamin Ridgway, 43 Jamie Gould, 44 Stephanie Schiffers, 45 Joanna Bendyna, 47 Jane Wibley, 48 Joanna Haywood, 49 Fiona How Ni Foong, 50 Hafsed Javed, 51 Liana Vella-Zarb, 52 Peter Galek, 53 James Mannion, 54 Stephen Mansell, 55 Russell Johnstone, 56 Mukhtar Kurawa, 57 Alison Edwards, 58 Matteo Lusi, 59 Shaun Evans, 60 Richard Arthur, 61 Nasir Abbas, 62 Umut Aydemir, 63 Helena Shepherd, 64 Elisabetta Iengo, 65 James Haestier, 66 Theodore Lazarides, 67 Wesley Chan, 68 Tien Teng Ong, 69 Vesal Naseri, 70 Peter Abram, 71 Stuart Fisher, 72 Simon Lancaster, 73 Delia Haynes, 74, Laura Budd, 75 Nicola Barry, 76 Rachael Harper, 77 Stuart Turner, 78 Matthew Johnson, 79 Sarah Lister, 80 Peter Byrne, 81 Anne Soleilhavoup, 82 Adam Todd, 83 Gareth Lloyd, 84 Andrew Schwarz, 85 Eddy Martin, 86 Robert Less, 87 Adam Cowell, 88 Zineb Bennechernene, 89 David Berry, 90 Helen Maynard, 91 Susanne Huth. 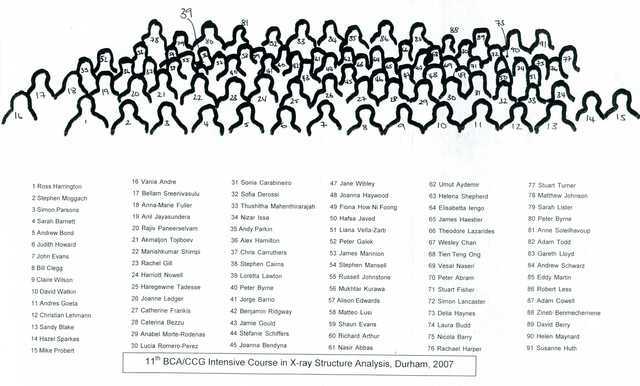 Identification key for participants at the 11th BCA Intensive Course in X-ray Structure Analysis.